From the sounds of it, and the initial first impression, the Black Ultimate Survival Knife is just about the best thing since sliced bread. It's basically a survival kit built right into the handle of the knife. If you twist the handle open, a whole plethora of goodies falls out into your lap. You'll find matches, striking paper, a fishing line, a sinker, and a hook inside. Another surprise, a sharpening stone, is hidden in the included belt sheath. And there's even a compass on the opposite side of the pommel. I'm a bit wary of these storage compartments since they tend to weaken the handle of the knife, but they sure are convenient. The knife itself is made from blackened stainless steel and hardened rubber. Nothing fancy about the blade; its plain edge comes to a nice point at the tip. But be forewarned: this isn't the best utility knife as far as wielding and balance goes. It's 15 inches long and it's a lot heavier than it looks. Some owners have commented that the blade is hard to sharpen as well. So it might not be the highest quality we've seen. But if you're a fan of all-in-one inclusive deals, and you won't be using an outdoor knife every day, give the Black Ultimate a try... especially if you need something at low cost. Plus, if you don't like it, you can return it for a full refund including shipping. 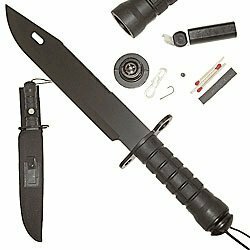 If you're looking for an all-inclusive kit that's a bit higher quality, check out the United Cutlery Bushmaster survival knife.